Greetings from Tokyo where the cherry blossoms have bloomed and ushered in beautiful spring weather! With the first full year of the 2016–2019 term underway, the Executive Committee has been busy with a number of activities. 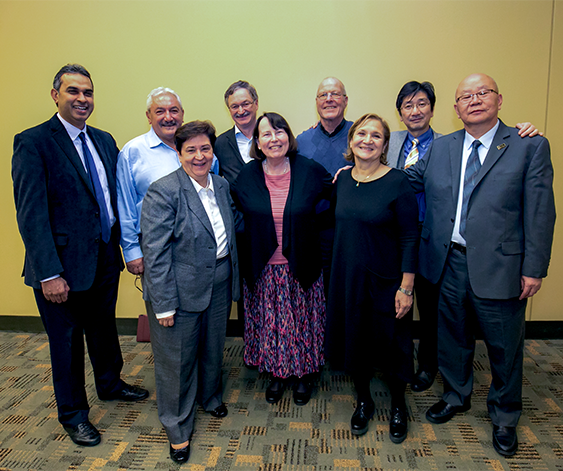 We held our first EC meeting in Baltimore in March during the SOT Annual Meeting, Vesna Matovic and Peter Di Marco convened the first CTDC10 scientific program committee meeting, SOT reported on the great progress they are already making on organizing ICTXV in Honolulu, Hawaii, and we met with the leadership of several societies and other friends of IUTOX. IUTOX also organized another Global Collaboration Coffee event, kindly hosted by SOT, where we featured a panel to discuss Sustainable Development Goals (SDGs), which were established by the United Nations and adopted by numerous international organizations including WHO. With 17 “Global Goals” and 169 targeted activities to choose from, IUTOX focused on the issues of reducing non-communicable diseases; risk assessment and systematic reviews; green chemistry; and mentorship and educational resources. Please see a complete report on the IUTOX website. Please let me know your opinion of CTDC and ICT meetings and your ideas to improve them. Please let me know what other types of programming you expect from IUTOX other than CTDC and ICT. Is your society able to dedicate financial resources to create joint programming with IUTOX? Is there any activity you recommend that IUTOX can do with your society without cost? I received many replies and thank everyone who took the time to send me your thoughts and ideas. The most common theme identified by societies large and small is the need for more toxicology courses and training at the college and university level. I also heard from you about the importance of IUTOX continuing to provide resources and information to the toxicology community at large with special requests for webinars, travel awards, and research funding opportunities. 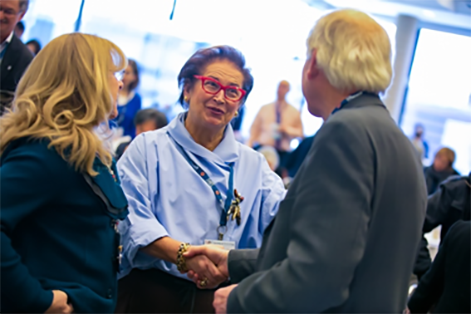 The idea of joint programming between IUTOX and member societies was well received, especially for specific training on “hot topics” or courses leading to earning one of the many certifications offered by member societies. With the political landscape changing in many countries around the word, there is an interest in receiving more information to better understand the effects of changing governments and their leaders on science. Your ideas and comments have informed me and the EC about the work we need to do over the next three years. I have asked the EC to review the survey results, to be responsive where we can and to identify new partnerships with our member societies to advance common needs and interests. We will need your help and hope you will get involved when you and your organizations are called upon to work with us. With stretched resources in every part of the world, it is imperative to work together and to find the strength in our numbers! This column features past travel award winners of ICT and CTDC meetings, RASS trainings, and recipients of SOT/SOT Endowment/IUTOX travel awards. True to its mission, IUTOX has consistently raised and awarded funds for travel awards from private industry and scientific communities on a local, regional, national, and international level. If you are a past recipient of an IUTOX sponsored travel award or risk assessment training, we want to hear from you. Please contact iutoxhq@iutox.org with your “Then and Now” success story! 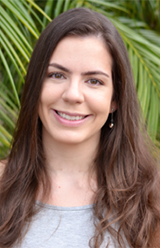 IUTOX thanks Dr. Bianca Ferrucio Zandonay for serving as our IUTOX Notable in this issue! IUTOX: What degree(s) do you hold and from which institution? Zandonay: I hold a BSc degree in Biomedical Sciences and a MSc degree in Pathology from the São Paulo State University (UNESP), and a PhD degree in Toxicology from the University of São Paulo (USP). IUTOX: What is your current job title? Zandonay: I am a Toxicology Consultant at Planitox, a Brazilian consultancy company. IUTOX: What is the focus of your work? Zandonay: My work aims at evaluating the safety of chemical compounds with a focus on the agricultural industry. We elaborate and review scientific reports, provide follow-up of toxicological studies, and perform quantitative structure-activity relationship (QSAR) analysis and toxicological risk assessment of substances for registration in Brazil. IUTOX: Is toxicology a growing field in your country? Zandonay: Yes. In the last two decades, the Brazilian toxicology field underwent significant growth, mainly due to the increase in chemical production in the agricultural, cosmetics, and food industries. Consistently, pesticide use has increased substantially along with implementation of agricultural mechanization. Moreover, the Brazilian regulatory agency (ANVISA) has been constantly enhancing chemical safety evaluation, while making efforts to adapt to international toxicological guidelines. IUTOX: How many colleges and universities in your country offer toxicology coursework? In what departments or degree programs are toxicology classes taught? Zandonay: There are at least 10 universities offering toxicology courses in post-graduation programs, including stricto sensu and lato sensu courses. IUTOX: What involvement have you had with the Brazilian Society of Toxicology? Zandonay: I was affiliated to the Brazilian Society of Toxicology during my graduate years, having attended several meetings promoted by that institution. IUTOX: What advice do you have for young toxicologists entering the field today? Zandonay: As I have yet to become an expert toxicologist myself, I can only say be careful not to be focused on one specific line of research, or one specific technique during your training years, always keeping in mind that toxicology is a multidisciplinary field, and that the bigger picture is human and environmental health. Toxicology is in the daily news, in your family's routine and in your lifestyle choices, not only in the scientific papers, so be prepared to deal with a great amount of information and responsibility. Zandonay: It sure did. It helped me to strengthen old relationships and it certainly contributed to expand my career opportunities in the field of toxicology. The Academy of Toxicological Sciences (ATS) is the leading international organization that certifies toxicologists by peer review of education, professional experience, leadership, demonstrated achievement and scientific expertise. ATS is a growing professional organization; currently ATS Fellows are from countries of 17 IUTOX member societies. Through this article, we wish to introduce ATS to the larger IUTOX community and encourage applications by qualified candidates. foster the general principles of the scientific method in toxicological research, practice, teaching, and training. Perhaps the most visible purpose of ATS is to assure in-depth peer review of the professional qualifications of toxicology practitioners such that they employ high quality, objective, and unbiased understanding and interpretation of toxicity data developed for the protection of public health and the environment. ATS was created, in part, to recognize the qualifications of both generators and interpreters of data related to the toxicity and safety of chemical substances. ATS certifies toxicologists through a peer-reviewed application process conducted by its Board of Directors. Successful applicants are internationally recognized, and exemplify a high standard of accomplishment in the field. Through this deliberate process, ATS ensures a high standard of professional experience and practice for toxicology professionals engaged in the generation and translation of toxicology data and information to protect human health and the environment. The National Academy of Sciences/National Research Council [NAS/NRC] recognizes ATS members as experts in toxicology. Thus, being a Fellow of ATS is an internationally recognizable and cherished honor. The ATS was established to underscore the Scholarship of the organization through its members, and the recognition of the numerous specialties developing and maturing within the field of toxicology. Since members were accepted into ATS by peer-review, the title “Fellow of ATS” was created. ATS not only certifies toxicologists by peer review of their professional achievement, but also imposes a code of ethics that assures ATS Fellows who participate in research and testing, who determine safety and risk-benefit, and who make regulatory decisions that impact public health and the environment, exercise sound scientific judgment that is free of bias and based on the scientific data. The purpose of this recognition and the ATS credential is to ensure, through peer review, the competence and experience of toxicologists. Candidates for consideration must have demonstrated evidence of knowledge of toxicology and active involvement in toxicological activities. A Fellow of the Academy must have an exemplary record of professional accomplishment as well as extensive evidence of recognition by peers of competency and sound scientific judgment in toxicology as reflected by appointment or election to councils, committees, etc. Evaluation and integrated interpretation of the human health implications of data describing toxic effects occurring in humans or experimental animals resulting from exposure to chemical, biological, or physical agents. The application of toxicological data to the development of standards protective of human and environmental health. The Academy of Toxicological Sciences is continuing its evolution. In addition to its primary mission of certifying individuals as professional toxicologists, the ATS Board of Directors confers the Mildred Christian Award for career achievement in the field and is expanding its activities to include outreach and communications on topics of importance to our field. Look for future articles in the IUTOX Newsletter on these topics. While fulfilling its mission to educate, lead, and serve professionals in toxicology, the American College of Toxicology is pleased to be an active member of IUTOX by expanding our educational outreach efforts around the world. ACT President Tracey Zoetis and ACT Past President Hanan Ghantous met with IUTOX and many of its society members at the recent Society of Toxicology Annual Meeting and discussed new ways to collaborate to advance science. In line with this commitment to collaboration, ACT is pleased to announce that we are now providing access to our webinar recordings to IUTOX members. ACT will also provide the funding to send two of its Continuing Education courses to the Congress on Toxicology in Developing Countries in Serbia in 2018. This annual ACT course provides basic training in toxicology. Participants will obtain an overall understanding of the principles of toxicology and nonclinical safety evaluation. The course will include discussion of regulatory case studies and hands on analyses of nonclinical data. The course is intended to benefit individuals working with small and large molecules from chemical, biotechnology, and pharmaceutical companies, CROs and regulatory agencies interested in or currently practicing toxicology. This joint American College of Toxicology/Teratology Society course is being hosted in collaboration with the Thomas Jefferson University College of Biomedical Sciences. The course is designed to provide a basic understanding in reproductive and developmental biology and principles of various testing approaches for reproductive and developmental toxicology, with strong emphasis on the practical application of these principles and interpretation of nonclinical safety data as well as risk assessment. This course, taught by distinguished experts, will provide opportunities for scientists from all parts of the world to participate in a course providing basic training in toxicology. Participants will obtain an overall understanding of the principles of nonclinical safety evaluation with emphasis on the practical application of these principles and interpretation of nonclinical safety data. Regulatory toxicology in drug development will be emphasized, from both a European and a US perspective. Through the week the students will participate in tutored group study of regulatory cases and original data from a regulatory submission which will conclude with a half-day workshop on the last morning. ACT is offering an advanced course to complement “Toxicology for Pharmaceutical and Regulatory Scientists.” In this five-day intensive course, attendees will be provided detailed descriptions of principles of toxicology, effects of xenobiotics on organ systems, discussions of specific classes of toxicants, mechanisms of toxicity, risk assessment, and other contemporary toxicological concepts. The content of this course will provide contemporary toxicological concepts and information that should be helpful to those seeking certification in toxicology or to those seeking more advanced training in toxicology. The faculty consists of well-recognized experts in their field of study who are Board Certified by the American Board of Toxicology. Poster abstract system is now open with a deadline of July 1. A follow up meeting of members of EUROTOX EC and SOT Council members was held during the annual SOT in Baltimore. John Morris, SOT President, reiterated our goals and updated us on progress. The exchange of the SOT Distinguished Scholar and the EUROTOX Bo Holmstedt Memorial Lecture Award was agreed. The first EUROTOX Bo Holmstedt Memorial Lecture will be on the 2018 SOT programme, while the first SOT Distinguished Scholar Lecture at EUROTOX will take place during the 2018 Brussels congress. Read the rest of the article online. Novel toxicity testing methods are urgently required as traditional risk assessment approaches are insufficient to adequately predict the potential risks associated with any given substance, especially when considering normal life low-dose exposures. Therefore, new prediction models are needed for more intelligent and efficient safety assessments based on alternative testing methods in combination with in vitro testing and computational modelling. This conference, with over 90 attendees from across Ireland, explored alternative toxicity testing methods currently under development to accurately predict toxicity risk and reduce, replace and refine current animal testing methods. Speakers from Ireland and the UK contributed to the conference, including Assoc. Professor Breandan Kennedy from UCD. The IST Philip Chambers plenary lecture was given by Professor Ted Lock, Liverpool University, UK. The IST Iona Pratt medal in Toxicology, in memory of our colleague, was presented to Iain Murray, Athlone Institute of Technology. 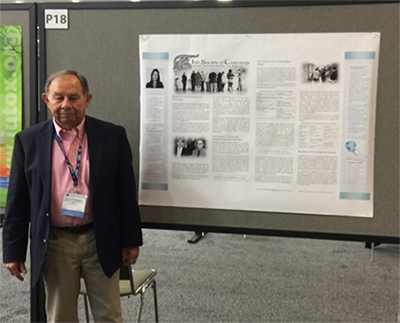 The Irish Society of Toxicology was also very kindly represented by IST member, Dr. John O’Donoghue, pictured here, at the annual Society of Toxicology meeting in Baltimore, Maryland, March 2017. The foundations of the JSOT are found in the Toxicology Research Group (TRG) and the Toxic Action Research Group (TARG), which were independently created in 1975 and 1976, respectively. TRG membership consisted of veterinarians, while the TARG was geared towards medical and pharmaceutical researchers. In 1981, the two groups merged and the Japanese Society of Toxicological Sciences (JSTS) was founded as a nonprofit scientific society. From its inception, the aims of the JSTS have been to promote the acquisition and utilization of knowledge in toxicology and to facilitate the exchange of information among its members, as well as among investigators worldwide. The JSTS was renamed the Japanese Society of Toxicology (JSOT) in 1997. In 2014, the JSOT became a general incorporated association, and it has developed into an organization of nearly 3,000 members. Conducting scientific and publicity related activities for members and the public. Engaging in other programs/projects deemed necessary to support the JSOT mission. The JSOT has five recognized member categories: General members, Student members, Honorary members, Meritorious members, and Supporting members. JSOT membership, which was 943 at the Society’s founding in 1981, had blossomed to 2,646 as of May 31, 2016, consisting of 2,617 members in Japan and 29 from overseas making it the second largest toxicology society in the world. Among its current members are 29 associates from around the world, including 12 from Korea, five from the USA, two from France, four from China, and one each from the UK, Singapore, Switzerland, Denmark, Germany and Hungary. Member affiliations are diverse as well, including industry and contract research organizations (70%), academia (22%), government agencies (6%), and others (2%). Read the complete article online. More than 6,800 scientists participated in the Society of Toxicology (SOT) 56th Annual Meeting in Baltimore, Maryland, March 12‒16. 2017, and more than 20% were international attendees. These scientists came from as far away as Australia, Brazil, Canada, China, Egypt, Europe, India, Israel, Japan, Mongolia, Nigeria, South Korea, and from every corner of the United States. As stated by SOT 2016‒2017 President John B. Morris, “We have gathered to share research, exchange ideas, and form collaborations to advance toxicology’s impact on health." During the Sunday Awards Ceremony, the recipients of the 2017 SOT/SOT Endowment Fund/IUTOX Travel Awards were recognized. 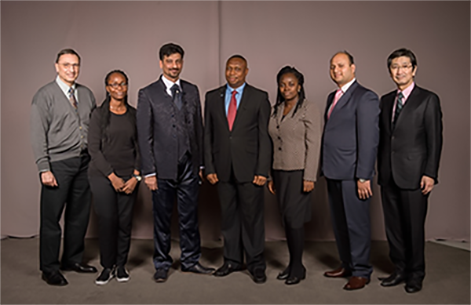 The recipients included Flora Ruth Aigbe, PhD, University of Lagos, Lagos, Nigeria; Hossein Hassanian-Moghaddam, PhD, Tehran, Iran; Chiagoziem Otuechere, PhD, Redeemer’s University, Ede Town, Nigeria; Oluwakemi Rotimi, PhD, Covenant University, Ota, Nigeria; and Nitin Verma, PhD, Baddi University of Emerging Sciences and Technology, Baddi, India. 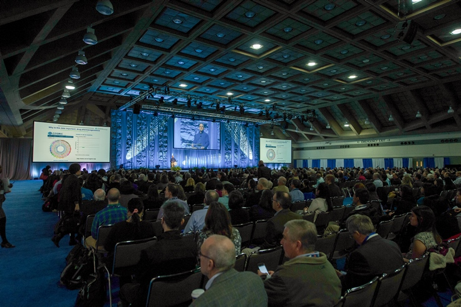 The SOT Annual Meeting featured 58 Scientific Sessions, 2,355 abstracts, 13 Continuing Education courses drawing more than 1,900 attendees, and three Plenary Sessions. The featured plenaries addressed Data Science, Precision Medicine, and The Exposome: Challenges and Opportunities, which are now available for viewing online to scientists internationally. IUTOX again hosted the 2017 Global Collaboration Coffee on the Monday of the SOT Annual Meeting. IUTOX President Jun Kanno welcomed everyone to the coffee and introductions were presented by Barbara Hales, Chair, Communications Committee; Dieter Schrenk and Lijie Fu, Co-Chairs, Education Committee. This year the agenda was framed by Sustainable Development Goals (SDCs) developed by the UN and adopted by WHO, IUPAC, and others. A hallmark of these SDGs is to encourage actions that can be taken by individuals as well as local, regional, national, and international organizations. The roundtable discussions at the coffee focused on the SDGs that have action items to: 1) Reduce the number of deaths and illnesses from hazardous chemicals, and 2) Enhance mentorship, education, and scientific research in all countries. IUTOX, as a WHO NGO, is in an excellent position to participate as a supporting organization by educating its member societies about the SDGs and encouraging them to participate in their own ways. Thirty-four toxicology societies from around the world participated in the Global Gallery of Toxicology. Now in its fifth year, posters of these sister societies were prominently displayed during the meeting, showcasing their formation, key accomplishments, strategic initiatives, and activities. The goal of SOT, and of IUTOX and all of its member societies, is to increase the reliance of international decision-makers on the science of toxicology and to advance human health and disease prevention. These posters were on display from Monday, March 13 to Wednesday, March 15, in the ToxExpo Exhibit Hall. The SOT Annual Meeting also provided many opportunities for undergraduate and graduate students and postdoctoral scholars to engage in peer-to-peer and mentoring activities, including the Undergraduate Diversity Program, Graduate Student-Postdoctoral Mixer, and Chat with an Expert. These activities are vitally important to building the next generation of toxicologists. ToxExpo, the largest toxicology exhibition in the world, this year featured 335 exhibiting companies, including 60 first-time exhibitors. These exhibitors included 80 international companies from 20 countries and US companies from states extending from coast to coast and border to border. In addition, 67 Exhibitor-Hosted Sessions were held. The Society is grateful for the generous contributions of the 45 diverse organizations that provided support for this stellar meeting. We welcome stakeholder participation and suggestions, or just feel free to browse. AltTox publishes a free monthly e-newsletter to provide users with ready access to new/updated website content. Each issue also includes a brief feature story. The AltTox Digest is a great way to keep in touch with new developments on the website and, in general, with the field of non-animal testing methods. You can read past issues and subscribe to the AltTox Digest online. Folia Water is a project that grew out of the Drinkable Book project by Theresa Dankovitch. The original book was both a filter and an instruction manual for how and why to clean drinking water. As Folia Water, the filter technology was adapted into Safe Water Books™, which have been distributed to over 30 countries around the world since the product launch in January. That’s over 1 million liters of safe water! Check out Folia Water’s interactive map to see images and to learn more about our field sites (blue FW logo), our distribution sites (orange FW logo), partner sites (blue dots (testing), and orange books (distribution)), museum exhibits (purple FW logo), and public talk appearances (orange and blue FW logo). When Ebola struck West Africa in 2014, countries with little or no scientific capacity suffered the most, and the cost of the US response to help them soared above $2 billion. A new Fogarty program is aimed at strengthening scientific expertise at institutions in Guinea, Liberia and Sierra Leone so that when the next outbreak comes, they will be prepared to rapidly respond. The goal is for US scientists to partner with their African counterparts to plan research training programs that would enable quick implementation of therapeutic or vaccine trials when the next infectious disease threatens. Visit the WHO website for resources including publications, data, WHO programs, partnerships, and other projects. Access the www.who.int/ipcs/network/en/ to find information regarding human health chemical risk assessment resources worldwide. Also find the latest issue of the WHO Chemical Risk Assessment Network newsletter. GCM/NCD Working Group on health education and health literacy for NCDs was held on 27-28 February 2017 in Geneva. The first pre-Dialogue caucus meeting let by the International Federation of Medical Students' Associations (IFMSA) in Budva, Montenegro draws to a close. The GCM/NCD Community of Practice (CoP) on NCDs and the Next Generation is launched. Save the date: the GCM/NCD is hosting its fourth Global Dialogue meeting. The Dialogue meeting will be on 'how governments can promote policy coherence between different spheres of policy-making that have a bearing on noncommunicable diseases"–20 October 2017 in Uruguay. The health sector participated in the First meeting of the intersessional process to prepare rec­ommendations regarding the Strategic Approach and sound management of chemicals and waste beyond 2020. Around 20 ministries of health from all over the world and many health-focused civil society organizations attended the meeting. A key video statement was delivered addressing the importance of sound management of chemicals and the need for multi-sectoral and multi-stakeholder engagement, as well as a WHO draft road map to enhance health sector engagement towards the 2020 goal and beyond. The WHO road map was described by many during the meeting as useful for assessing and identifying national priorities and it was pro­posed as a model for other sectors to consider. The road map will be discussed in the upcom­ing World Health Assembly in May 2017. During a health sector meeting organised by WHO, 50 participants shared experiences about chemical issues and discussed the role the health sector can play in addressing them, both within the health system, as well as by working with others. The meeting was held from 7 to 9 February 2017, in Brasilia, Brazil. For more information click here. This year, World Water Day, held on 22 March every year, focused on taking action to tackle the water crisis. Today, there are more than 663 million people living without access to a safe water supply close to their home. They spend countless hours queuing or walking to and from sources, and coping with the health impacts resulting from the use of contaminated water. Globally, the vast majority of all the wastewater from our homes, cities, industry and agriculture flows back into the natural environment without being treated or reused. This year’s theme, Why waste water? was set in support of SDG 6.3 on improving water quality and reducing, treating and reusing wastewater. Reducing and safely treating and reusing wastewater, for ex­ample in agriculture and aquaculture, protects worker, farmers and consumers and promotes food security, health and well-being. For more information on World Water Day 2017 click here. For the feature story, click here. 5 APRIL 2017 | GENEVA - WHO is alarmed by serious reports of the use of highly toxic chemicals in an attack in Khan Shaykhun, southern rural Idleb, Syria. According to Health Cluster partners on the ground treating the patients, at least 70 people have died and hundreds more have been affected. Doctors in Idleb are reporting that dozens of patients suffering from breathing difficulties and suffocation have been admitted to hospitals in the governorate for urgent medical attention, many of them women and children. As an NGO with WHO, IUTOX is a partner in all WHO initiatives and especially promotes World No Tobacco Day every May 31. Every year, on 31 May, WHO and partners mark World No Tobacco Day (WNTD), highlighting the health and additional risks associated with tobacco use, and advocating for effective policies to reduce tobacco consumption. The theme for World No Tobacco Day 2017 is "Tobacco—a threat to development." WHO is calling on countries to prioritize and accelerate tobacco control efforts as part of their responses to the 2030 Agenda for Sustainable Development. Tobacco control has been enshrined in the Sustainable Development Agenda. It is seen as one of the most effective means to help achieve SDG target 3.4 of a one-third reduction globally, by 2030, of premature deaths from noncommunicable diseases (NCDs), including cardiovascular disease, cancers and chronic obstructed pulmonary disease. Strengthening implementation of the WHO Framework Convention on Tobacco in all countries is an additional target to be met by governments developing national sustainable development responses. Tobacco growing requires large amounts of pesticides and fertilizers, which can be toxic and pollute water supplies. Each year, tobacco growing uses 4.3 million hectares of land, resulting in global deforestation between 2% and 4%. Tobacco manufacturing also produces over 2 million tons of solid waste. Visit the ICSU website for resources including publications, events, science, and international policy. by TWAS ROLAC to a researcher or writer who has made significant contributions to popularize Science and Technology. The US $3,000.00 prize will be awarded to a candidate engaged in popularizing Science and Technology. A “Special Mention” may be awarded, as an incentive to a researcher, if the prize committee unanimously so decides. In that case, the;awardee is eligible for the prize in other years. The candidate is responsible for his/her own registration. Description of candidate’s works justifying their significant contribution to popularization of science. Up to five significant publications by the author in this area (electronic copy). The complete set of documents must be emailed all together, at the same day, under the title (subject) “Popularization of Science Prize”. In case the prize is not awarded, the money prize will not be accumulated for the next edition. The Chair of TWAS ROLAC will preside over the Prize Committee and will have the quality vote. The winner will be announced during the TWAS General Meeting. The United Nations has developed a comprehensive 15-year plan with 17 sustainable development goals as its centerpiece. Adopted by numerous international organizations including WHO and ICSU, IUTOX embraced SDGs as the theme of its Global Collaboration event held at the SOT Annual Meeting on March 13, 2017. Since the 1972 UN Conference on the Human Environment the reach of sustainable development governance has expanded considerably at local, national, regional and international levels. The need for the integration of economic development, natural resources management and protection and social equity and inclusion was introduced for the first time by the 1987 Brundtland Report (Our Common Future), and was central in framing the discussions at the 1992 United Nations Conference on Environment and Development (UNCED) also known as the Earth Summit. In 1993 the General Assembly established the Commission on Sustainable Development (CSD), as the United Nations high level political body entrusted with the monitoring and promotion of the implementation of the Rio outcomes, including Agenda 21. The 2002 World Summit on Sustainable Development advanced the mainstreaming of the three dimensions of sustainable development in development policies at all levels through the adoption of the Johannesburg Plan of Implementation (JPOI). A process was created for discussing issues pertaining to the sustainable development of small island developing States resulting in two important action plans - Barbados Plan of Action and Mauritius Strategy. The Third International Conference on Small Island Developing States, which was held in 2014, took these processes forward and provided the SAMOA Pathway. In 2012 at the Rio+20 Conference, the international community decided to establish a High-level Political Forum on Sustainable Development to subsequently replace the Commission on Sustainable Development. The High-level Political Forum on Sustainable Development held its first meeting on 24 September 2013. At the Rio+20 Conference, Member States also decided to launch a process to develop a set of Sustainable Development Goals (SDGs), which were to build upon the Millennium Development Goals and converge with the post 2015 development agenda. The process of arriving at the post 2015 development agenda was Member State-led with broad participation from Major Groups and other civil society stakeholders. On 25 September 2015, the United Nations General Assembly formally adopted the universal, integrated and transformative 2030 Agenda for Sustainable Development, along with a set of 17 Sustainable Development Goals and 169 associated targets. IUFoST was invited to participate in a series of meetings held in Nairobi, Kenya in conjunction with the 22nd Session of FAO/WHO Regional CODEX Coordinating Committee for Africa (CCAFRICA) from January 16–20. Dr. George Ooko Abong', Food Science and Technology Platform of Kenya (FoSTeP-K, IUFoST adhering body), chaired a one-day Food Safety Symposium on January 19, organized by FoSTeP-K with support from IUFoST. IUFoST African Adhering Body members from Zambia, Tanzania, Burkina Faso, Ghana, Nigeria, Ethiopia, Uganda and Senegal participated. Interactive sessions included the Current Food Safety Scenario in Kenya and Uganda (Prof. Archileo Kaaya); Misconceptions and Misinformation on Food Additives, with special emphasis on salt (Dr. Donald Mercer); Food Safety Concerns of GMOs, Prof. T. Mutui of National Biosafety Authority of Kenya; European Labeling Approaches to Promote Consumer Education and Selection of Packaged Foods, Dr. Pamela Byrne (Chief Executive Officer, Food Safety Authority of Ireland (FSAI); and Contribution of African Higher Education to Food Safety, Prof. Anakalo Shitandi, Kisii University, Kenya. Group discussions centred on the major issues facing Africa and steps to be taken to improve food safety in the continent through application of food science and technology. An additional session featured a number of topics in the area of Food Science and the Global Food Safety Curricula Initiative (GFSCI). IUFoST also was one of three organisations invited by CCAFRICA to speak to the delegates and presented on the topic of the Science-based Food Regulations. The role of food science professional bodies in standards development was presented by the Hon. Prof. Ruth Oniang'o, IAFoST President, and Prof. Kiiyukia Ciira, Mt. Kenya University, spoke about the importance of science in food standards and regulation development. Dr. Gerald Moy, IAFoST Fellow and co-chair of the IUFoST Aflatoxin Working Group, gave a presentation on how food businesses can be shaped through CODEX standards, while Dr. Pamela Byrne (FSAI) presented on the science of risk assessment and risk communication. A discussion on achievable outcomes concluded the session, which was attended by more than 100 delegates from 22 African countries. Find out more on the IUFoST website. HESI is an international non-profit public private partnership engaged in collaborative scientific research to help resolve human and environmental health challenges. This year it will be holding its annual scientific meeting in Dublin. Registration is complimentary for delegates from academia, research institutes, foundations and government. To read more visit http://hesiglobal.org/hesiannualmeetings/. We are thrilled to announce that the Scholars at Risk Network 2018 Global Congress will be held in Berlin, Germany, 23–26 April 2018, in partnership with the Alexander von Humboldt Foundation, Freie Universität Berlin, and Scholars at Risk Germany Section. The SAR Global Congress provides an opportunity for members and partners to gather, share experiences hosting at-risk scholars, learn about new activities for faculty, staff, and students, and discuss current issues and strategies for promoting academic freedom and related higher education values. The 2016 SAR Global Congress in Montreal drew more than 180 people from 87 universities in 37 countries for four days of workshops, keynotes, plenaries, section meetings, and parallel sessions. We are delighted to host the 2018 SAR Global Congress in Berlin in conjunction with the Humboldt Foundation's annual workshop on the Philipp Schwartz Initiative. At a time of ongoing refugee crises, armed conflicts, and growing attacks on scholars, students, and universities around the world, the German higher education sector has made great efforts to welcome refugee scholars and students to German campuses. The Alexander von Humboldt Foundation has helped support many through the Philipp Schwartz Initiative, providing a model for other states. Together with longtime SAR member Freie Universität Berlin, in 2016 the Humboldt Foundation helped to launch the Scholars at Risk Germany Section, now including more than 30 German institutions. These actions, like those of so many SAR network members around the world, send a strong message about the critical role the higher education community can play in guarding against threats to the values of the global knowledge community. Now more than ever, we must come together to share and defend those values. Please save the date and plan to join us in Berlin! See more information about Scholars at Risk Network. The aim of the course in Safety Assessment of xenobiotics and Biotechnological Products is providing the relevant chemical, biochemical, biotechnology and physical procedures for the study and identification of hazard and risk arising from xenobiotics and biotechnology products. At the end of the training, the graduates will be able to evaluate dossiers of xenobiotics and biotechnology products on the basis of accurate scientific principles and methodological approaches, internationally agreed, in order to provide quantitative safety assessment. Particular attention will be paid to the application of existing regulations (in Europe, USA, etc. ), through the development of integrated different areas including legislation, chemistry, toxicology and pharmacology, biotechnology, and risk analysis. IMPORTANT: Non-EU citizens resident abroad who do not have an Italian residence permit, must also submit their formal pre-application to the Italian Embassy or Consulate in their country, by the annually established deadline. To apply: www.unimi.it select “Applying for a Master Programme without Admission Test.” After submitting the application candidates will be contacted for an interview in English. The interview will be done remotely via electronic devices. In an effort to make ACT’s free educational Signature Webinars available to IUTOX societies around the world, access is now available to our webinar archives to nonmembers! ACT hosts quarterly webinars on current topics in toxicology, including primarily drug and chemical safety assessments. Presenters are experts in their field, with backgrounds in government, industry or academia. The goal of the webinar series is to provide accessible education on topics in toxicology to scientists worldwide. Please visit the ACT website to access the variety of recorded webinars available. A partnership of scientific societies with the goal of improving public health through a collaborative interdisciplinary approach. Strengthening partnerships among scientific and health-based organizations to increase awareness of the impact of toxicology and related subjects on human health. Functioning as a means to enhance cooperation among societies as equals with the goal of accomplishing tasks benefiting human health and disease prevention through joint and several shared activities. Please visit the SLC website to view a complete list of free webinars on a variety of topics. The Society of Toxicology is pleased to announce the availability of the recording and presentation slides from the 2016–2017 SOT FDA Colloquia: Considerations for the Determination of Adversity in Food Chemical Safety Evaluations. Historically, food safety laws and regulations in the United States were aimed to protect against adulteration and microbial contaminations, but have evolved gradually to also address the safety of food ingredients, food additives, and food contact materials. To prevent adversity, broadly defined as “harm to the biological system” guidelines for conducting chemical and toxicological safety assessments have been established to include the evaluation of food compounds intentionally added to foods (such as food additives or novel ingredients), as well as chemicals that unintentionally may become part of foods (such as food contact materials and environmental contaminants). The resulting food safety frameworks, as well as toxicological assessments driving these frameworks, rely in many cases on extrapolations from animal studies to humans and use endpoint-based no observable adverse effect levels (NOAEL) to derive health-based guidance values such as acceptable daily intake (ADI) and tolerable daily intake (TDI). This colloquium will begin by introducing current concepts underlying determinations of adversity from food compounds utilizing chemical characterization, in vitro or in silico assays, as well as animal and human toxicology studies. Second, the definitions of adversity (harm) will be considered in the context of the laws and regulations that apply to foods and food ingredients. Third, a case study on low calorie sweeteners will be provided to illustrate determinations of adversity by describing what data were used in the assessment of safety. Fourth, alternatives to the current frameworks for adversity determinations will be discussed in terms of their strengths and weaknesses considering a toxicological, decision-making and public perspective. Finally, the colloquium will conclude with a panel discussion addressing the key issues brought up by the speakers and questions from participants. Information about the series and links to materials from all the sessions can be accessed from the Colloquium website. New Approaches to Adversity Assessment in Food Safety Evaluation Daniel Krewski, University of Ottawa, Ottawa, ON, Canada Colloquium Chairs Bernadene Magnuson, Health Science Consultants, Inc., and Sabine Francke, US FDA, CFSAN, moderated a roundtable discussion following the presentations. Save the date for the next two IUTOX Congress! Thank you in advance for your continuous support and contributions, and we look forward to welcoming you to Serbia! Mark Your Calendar: Early Bird registration until January 31, 2018! If your member society would like its meetings added to our Upcoming Meetings section on the IUTOX website, please send an email to IUTOX Headquarters. View a full listing of the Upcoming Meetings. This highly acclaimed course will provide training in Toxicology as applied in Drug Development to scientists from all parts of the world. Participants will obtain an overall understanding of the principles of nonclinical safety evaluation with emphasis on the practical application of these principles and interpretation of nonclinical safety data. Regulatory toxicology in drug development will be emphasised, from both a European and a US perspective. Through the week the students will participate in tutored group study of regulatory cases and original data from a regulatory submission which will conclude with a half-day workshop. This course is recognized by EUROTOX as providing 32 hours of education for continuing professional development. It is approved by the Royal Society of Biology for purposes of CPD and may be counted as 132 CPD credits. EUROTOX 2017 will take place September 10–13, 2017, in the Slovak National Theatre in Bratislava, Slovakia. The scientific programme comprises 5 Continuing Education Courses, 32 scientific sessions and several Keynote Lectures from distinguished scientists. We expect about 1,200 participants from all over the world as well as more than 40 exhibitors from the pharmaceutical, chemical and biotechnological industry. Updated information will be also announced on Facebook and LinkedIn. We invite you to share your comments with us. must commit to attendance on hearing if they have been accepted for a bursary. Acknowledgement: All accepted applications will be acknowledged in due time. If you do not receive an acknowledgement you should assume your application has not been received. The American College of Toxicology is offering a limited number of International Travel Grants to toxicologists outside of North America to attend our 38th Annual Meeting in Palm Springs, California, November 5–8. Each grant will cover Annual Meeting registration fees, the cost of a round-trip economy airfare, and up to four nights stay at the Headquarters hotel. Recipients will be required to present a poster at the meeting. Please visit the ACT Website to apply. The application deadline is May 1. There is an increasing need for highly qualified toxicologists in all European countries including the new EU member states and accession countries. EUROTOX has set standards of qualification by creation of the European Registered Toxicologist (ERT) in the early 90's, recently updated in the Guidelines for Registration 2016. ERT courses in several countries offer comprehensive theoretical training required for qualification in Toxicology as ERT. Basic and Advanced Toxicology courses financed by EUROTOX and organised by various national societies across Europe under the guidance of the EUROTOX Education and Registration SubCommittees are also eligible for fellowship support. Support requested must be for attendance of an ERT course or module outside the applicant’s country of residence and currently recognized as providing training for ERT registration (as per guidelines indicated above). Mandatory: personal statement (letter of motivation) why they want to study toxicology, curriculum vitae (CV), copies of relevant university certificates (e.g. bachelor, master, diploma, PhD), and recommendation letter of one of the following: employer, university teacher, supervisor or other toxicological scientist who knows the applicant personally. Optional: relevant documentation such as on previous attendance of toxicology-related courses, and/or on conduct of scientific or regulatory work broadly related to Toxicology, scientific publications or reports, any other relevant certificates or achievements. b) Applicants already on the track for Registration: they have completed successfully at least one module of an ERT course as listed in Section B or can document involvement in practical training in toxicology (Section C of Guidelines for Registration 2016), success being documented by certificates, publications (incl. abstracts, posters) or reports/assessments, or recommendation letter of person responsible for the candidate’s education. They will also provide a letter of motivation and a CV. Candidates should be member of a national toxicology society or of EUROTOX. If the applicant has not previously supported by this program, a statement of willingness to apply for membership will be sufficient. Good knowledge of English and of the course language, if different, is required and needs to be stated. Applications must contain the information listed above under II. Applications for more than one course/module are possible provided they fall within the specified period following the application deadline. Applicants who have missed a deadline but wish to attend a course in the following 6-month period are advised to contact fellowships@eurotox.com before submitting a formal application. The EUROTOX Education and Registration Subcommittee will evaluate all applications and make the final decision. Notification of applicants on the decision is expected within 4 weeks after the application deadline. If more eligible candidates apply than can be funded, selection will be based on qualification criteria. Candidates on track for registration and candidates from countries offering no recognized toxicology training (e.g. Eastern and South Eastern European countries) will be preferentially selected. Upon justified request, expense support can be differently allocated to within the total amount of € 1000.00 per weekly course. Candidates requesting less than maximal support increase their chance of getting funded. Reimbursements will be made upon notification from the candidate after his/her module attendance, with written confirmation by the course director. A bank account and compilation of costs, signed by the applicant, with all receipts, must be added. Claims must be sent to the EUROTOX Treasurer by the end of the 6 month period in which the course was attended (June 30 or December 31) at the latest. For employed professionals of authorities (or SME, with justification): certification of the director of his/her unit that they have no funds for complete or at least partial funding of their employees’ education After end of course/module: Send refund claim to the EUROTOX Treasurer, with written confirmation of attendance by course director, bank account, list of expenses to be refunded, receipts of payments for travelling (ticket, boarding pass), accommodation, and course fee. After end of course/module: Send refund claim to the EUROTOX Treasurer, with written confirmation of attendance by course director, bank account, list of expenses to be refunded, receipts of payments for travelling (ticket, boarding pass), accommodation, and course fee. The Scholar will attend the 2018 SOT Annual Meeting and spend about four weeks with one or more SOT Member Hosts from established toxicology programs in academic, government, or industry organization(s) worldwide. The primary goal is to increase toxicology capacity in developing countries by providing professional opportunities for mid-career to senior scientists through relationships supported by SOT. The Scholars who are selected are expected to build on this opportunity by strengthening toxicology within their universities and countries. When the next Scholars are announced, applications will be sought from potential Hosts with related interests from established toxicology programs around the world. . Host applications are due September 8, 2017. The program provides up to $15,000 for each pair, with up to $10,000 travel support for the Scholar and $5,000 for the Host. Support is not provided for equipment, laboratory supplies, or renovations. More information about the program, including the application forms and a list of previous recipients, is available at Global Senior Scholar Program and questions may be directed to Betty Eidemiller at bettye@toxicology.org. The Society of Toxicology (SOT) solicits requests for funding for toxicologists to expand the awareness of toxicology and promote toxicology careers through the interaction of toxicologists with students who may not otherwise have the opportunity to learn about the discipline. Presenters may select from the SOT Introduction to Toxicology slide sets and SOT can provide career brochures. A ToxScholar submits a report and writes a post for the Communiqué detailing his or her experiences to help SOT track the impact of the program and to encourage others to carry out ToxScholar visits. Deadline for applications is October 9. Applications may be accepted after that date if funds remain. Please note: PhRMA Foundation also offers annual awards with a deadline of September 1. Awards for 2018 have a deadline of September 1, 2017 and will be accepted starting July 1, 2017. The overarching goal of the National Institute of General Medical Sciences (NIGMS) Postdoctoral Research Associate (PRAT) Program is to provide high quality postdoctoral research training in the basic biomedical sciences, in National Institutes of Health (NIH) intramural research laboratories, to a diverse group of postdoctoral fellows to prepare them for leadership positions in biomedical careers. The research projects proposed should focus on NIGMS mission-related areas of basic biomedical science. These include cell biology, biophysics, genetics, developmental biology, pharmacology, physiology, biological chemistry, computational biology, technology development, and bioinformatics. Studies employing model organisms are encouraged. The PRAT Program distinguishes itself by providing, in addition to the laboratory research experience, a structured training environment with extensive career development and networking opportunities planned and supported by this program. Deadline: October 3, 2017. For additional information and eligibility, please visit the NIH website. This directory of Non-NIH Funding opportunities includes a variety of international grants and fellowships in biomedical and behavioral research. Its goal is to provide information about additional funding opportunities available to those in the field of global health research. The directory is maintained by the Fogarty International Center, the international component of the US National Institutes of Health (NIH). See listing of funding opportunities on the NIH website. Early-career scientists gain connections and opportunities through TWAS. Every year, TWAS’s Regional Offices select up to 25 scientists younger than 40 as Young Affiliates. The honour is given to developing-nation researchers with at least 10 international publications who show potential for a high-impact career. During their five-year tenure, Young Affiliates build networks with other affiliates and with elected TWAS Fellows and attend international conferences such as the TWAS General Meeting. Learn more about how Young Affiliates are chosen. The World Health Organization (WHO) as the leader in global public health issues is committed to building future leaders in public health. WHO's Internship Programme offers a wide range of opportunities for students to gain insight in the technical and administrative programmes of WHO. The duration of WHO internships is between six to 12 weeks. Exceptionally, internships may be extended up to a maximum of 24 weeks depending on the needs of the WHO technical unit and your availability. WHO internships are not paid and all costs of travel and accommodation are the responsibility of the intern candidate. We’re eager to hear from you since IUTOX benefits from your feedback and ideas. If you would like to share your accomplishments and news with other member societies, please email your contributions to IUTOX Headquarters. Send us the dates and locations of your upcoming meetings and we’ll publish them on the IUTOX website. Share your society’s successes by submitting an article to be published in the IUTOX newsletter. Let us help you get the word out about calls for papers and nominations for awards and prizes. Give us feedback on how to make the IUTOX newsletter and website better! Familiarize yourself with the IUTOX Executive Committee and feel free to contact us with your questions or comments. Every IUTOX member’s viewpoint matters and all ideas are welcome! IUTOX has consistently added new members each year to reach our current number of 63 member societies. This is good news and shows that toxicology is growing as a discipline valued by the global scientific community. If you are interested in forming a society or need help doing so, please see the IUTOX website or contact us at IUTOX Headquarters. We look forward to hearing from you!